When Lisa and I were married 12 years ago, one of the hors d’oeuvres floating around the reception was assorted colors of Marshmallow Peeps. They were all gone before we could get away from the photographer and join the party. 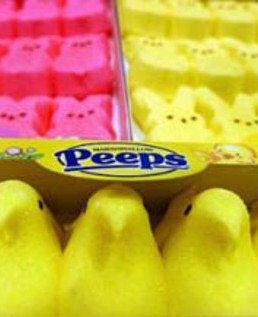 For the last ten years, Peeps have been the best-selling non-chocolate Easter candy. The amount of Peeps chicks and bunnies eaten at Easter could more than circle the Earth’s circumference. Scott Westerfeld wrote a book called Peeps, but it was false advertising. Hadn’t seen the Peep games before … LOL! Brilliance! We spent much time Saturday night searching for Peeps. Our grocery store was full of them. Big, huge, mountainous displays, in every color of the rainbow, all different shapes of Peeps. So, Saturday night, after dinner, we cheerfully volunteer to stop and pick up some Peeps for my dad on the drive home, so my mom doesn’t have to either (a) get out of the car and walk, or (b) be left in a running car like a puppy. Knowing that Gertrude Hawk (chocolatier) in our local mall sells Peeps, we decide to stop at Fanny Farmer (chocolatier) in the Latham Mall. Well, the Fanny Farmer is long out of business and the Latham Mall is seriously skeevy — I remember when it was THE place to go shopping in the area! — so we tried the CVS across the street. Still no Peeps. Getting desperate, we continued on down the road, and stopped at a Price Chopper, where we were informed that the Capital District had been out of Peeps for the last two weeks, because people in the Capital District really love their Peeps! In a last ditch effort to say we’d tried literally EVERY source for Peeps, we hit WalMart. They had Peeps. Piles and piles of Peeps. But not, sadly, cashiers to man the registers. Still, eventually, Peeps were purchased and brought home in triumph. There are some people that prefer their Peeps properly aged to perfection. So, did you see the new green Peeps? I heard rumor of a sugar-free variety, but that can’t possibly be a true member of the Peep family. I bet the other Peeps shun them.